The second generation of the MINI Countryman is the biggest and most versatile model in the entire range of the tradition-steeped British brand. And another superlative now applies to the power unit of the MINI John Cooper Works Countryman. With an output of 170 kW/231 hp (combined fuel consumption: 7.4 l/100 km; combined CO2 emissions: 169 g/km), it is the most powerful engine ever to be fitted in a MINI: in combination with the standard all-wheel drive system ALL4 and a robust vehicle concept, it ensures that the latest addition to the family of top John Cooper Works athletes takes the MINI experience to a whole new level – in terms of both race track feeling on the road and extreme driving fun over unsurfaced terrain. The new MINI John Cooper Works Countryman sprints from zero to 100 km/h in 6.5 seconds with both the standard 6-speed manual transmission and the optional 8-speed Steptronic sports transmission. In doing so it is 0.8 or 0.7 seconds faster than the MINI Cooper S Countryman ALL4. The superior performance qualities of the new MINI John Cooper Works Countryman are likewise reflected in its elasticity on interim sprints, cornering agility and deceleration performance. These qualities are the product of an overall package that has been compiled based on John Cooper Works racing expertise, including not just the engine and all-wheel drive system but also a sports suspension with 18-inch John Cooper Works light alloy wheels and Brembo sports brake system, special body features to optimise aerodynamic properties and cooling air intake, and a model-specific cockpit with John Cooper Works sports seats. The exceptional standing of the new MINI John Cooper Works Countryman within the premium compact segment is underscored by means of exclusive standard features including MINI Driving Modes, LED headlamps, Comfort Access and the Radio MINI Visual Boost. 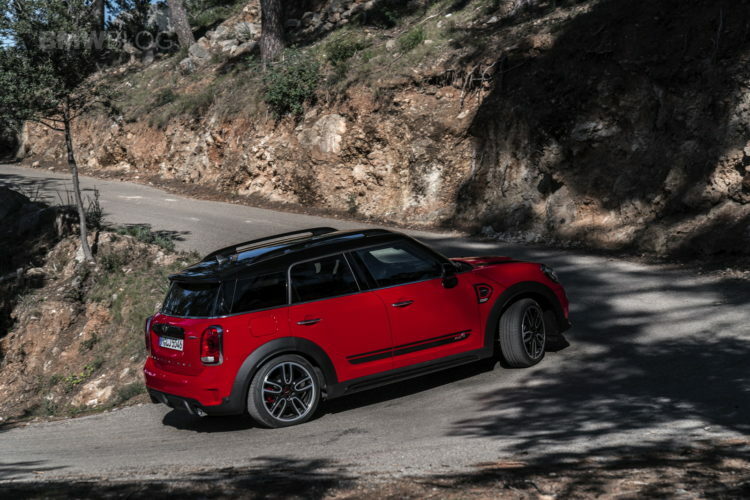 The new MINI John Cooper Works Countryman: an overview of the facts and figures. – 4-cylinder turbo engine with 170 kW/231 hp and 350 Nm torque. – Efficiency-optimised all-wheel drive system ALL4 as standard. – Sports suspension with Brembo sports brake system and 18-inch light alloy wheels. – Engine, suspension and aerodynamics harmonised based on John Cooper Works racing expertise. – Sprint from zero to 100 km/h in 6.5 seconds, 0.8 seconds faster than the MINI Cooper S Countryman ALL4, maximum speed: 234 km/h. – John Cooper Works Aerodynamics Kit with especially large air inlets at the front. – Model-specific interior with John Cooper Works sports seats. – Exclusive standard trim include LED headlamps, MINI Driving Modes and Comfort Access. – Five fully fledged seats, and a significant increase in space, luggage compartment size and versatility as compared to the predecessor model. – MINI Connected as a personal mobility assistant for everyday use and when travelling. 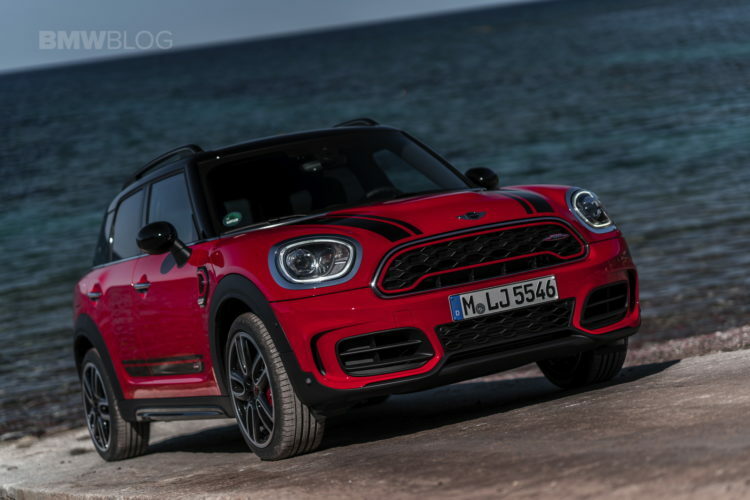 The new MINI John Cooper Works Countryman is the successor to the brand’s first top athlete designed for the compact segment and fitted as standard with the all-wheel drive system ALL4. The new car’s advancement over its predecessor is reflected not just in an output that is increased by 10 kW/13 hp and the efficiency-optimised design of the ALL4 system but also in enlarged external dimensions and a considerable increase in space, versatility and functionality. With an addition of some 17 centimetres in length and 3 centimetres in width along with a wheelbase extension of 7.5 centimetres, space availability on the five fully fledged seats is now significantly optimised. The luggage compartment can be expanded as required from 450 litres to as much as 1 390 litres. This makes the new MINI John Cooper Works Countryman a top athlete with all-round qualities that provides extreme driving fun and exceptional versatility – whether on the race track, away from asphalted roads, in everyday traffic or over lengthier distances. World premiere in Shanghai, market launch in spring 2017. The new MINI John Cooper Works Countryman will be presented to the public for the first time in April 2017 at the Shanghai Motor Show. The market launch will get underway in spring 2017. Developed from longstanding experience of race tracks and rally trails. 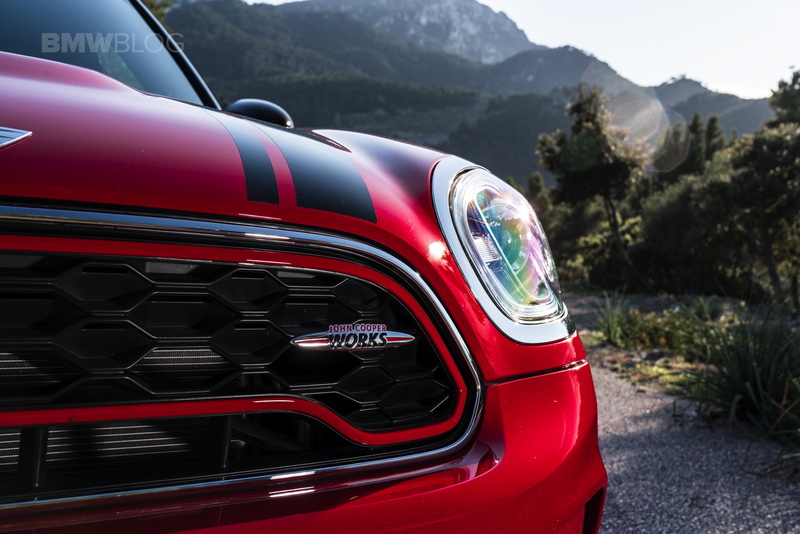 In addition to state-of-the-art technology, the distinctive character of the new MINI John Cooper Works Countryman is also derived from the brand’s longstanding and successful motor racing tradition. It was 55 years ago that the classic Mini clinched its first victory – when the Mini Cooper won the British Touring Car Championship. Since then the name of legendary sports car designer John Cooper has stood for the brand’s racing success and the extreme driving fun it offers on the road. Exactly 50 years after the last of three outright wins by the classic Mini at the Monte Carlo Rally, the new MINI John Cooper Works Countryman now points the way to further success in this discipline. The new edition of this all-rounder provides the basis for the competition vehicle developed by MINI and the X-raid Team for long-distance rallies. The MINI John Cooper Works Rally is set to take on the challenges of the world’s toughest marathon contests, starting with the Dakar Rally in 2017. As such it succeeds the MINI ALL4 Racing, which was developed based on the first generation of the MINI Countryman and won the Dakar Rally four times in succession. Perfectly harmonised overall package for top performance. The John Cooper Works brand has been integrated under the MINI umbrella for ten years. This close connection dates back to the early years of the classic Mini, whose sporting talent was discovered and promoted by John Cooper. 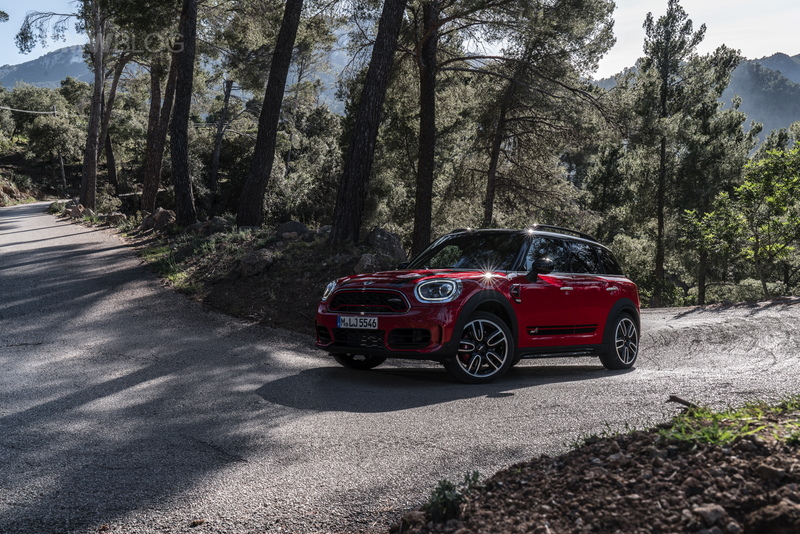 Today it impacts positively on the extreme driving enjoyment offered by the MINI John Cooper Works Countryman. 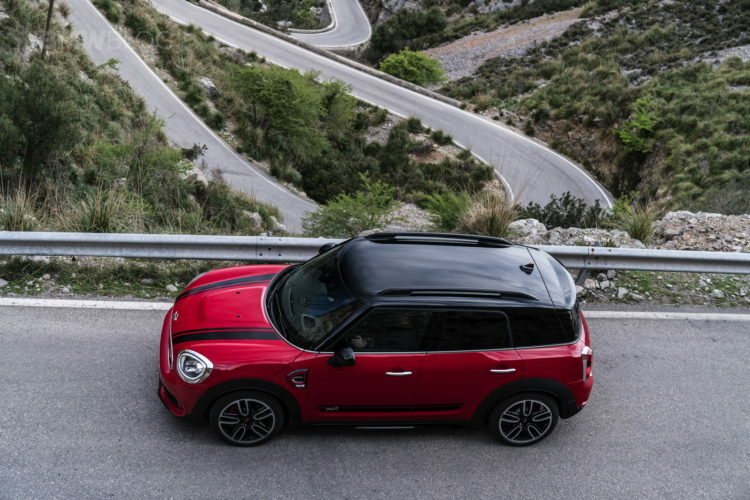 The engine, transmission, all-wheel drive, suspension, aerodynamics and cockpit design are not just geared towards top performance, they are also precisely harmonised with the vehicle concept of the new MINI Countryman. As a result, the latest John Cooper Works model is an overall package for thrilling performance, assembled with racing expertise. Engine: power delivery and sound with racing character. 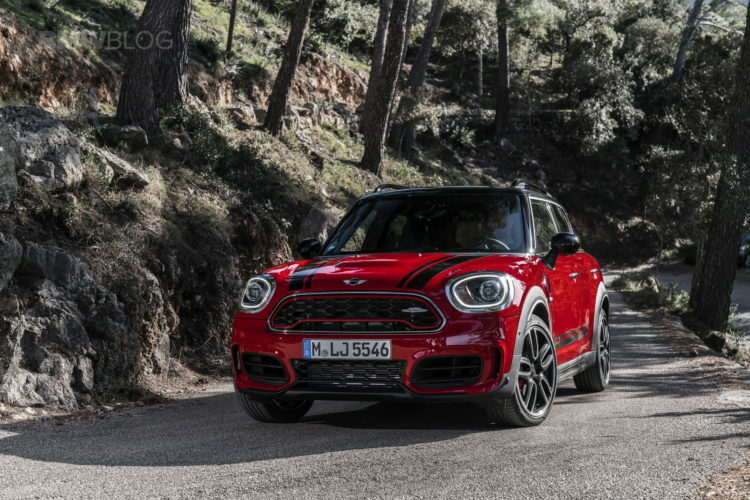 The 2.0-litre 4-cylinder engine installed transversely at the front of the new MINI John Cooper Works Countryman demonstrates performance characteristics inspired by motor racing. It has a specific version of MINI TwinPower Turbo Technology with a turbocharging system integrated in the cast steel manifold, petrol direct injection, the fully variable valve control system VALVETRONIC and variable camshaft control (double VANOS). Made of highly temperature-resistant material, the turbocharger generates a charge-air pressure which is now increased to 2.2 bar. This creates the basis for highly energetic and long-lasting power delivery. The engine puts its maximum torque of 350 Newton metres on stream at between 1 450 and 4 500 rpm. It delivers its peak output of 170 kW/231 hp within an engine speed range of 5 000 and 6 000 rpm. The particular features of the new engine developed for John Cooper Works models include specific pistons, a large charge-air cooler and an additional radiator. In addition there is a sports exhaust system that not only supports the engine’s performance characteristics but also gives them an impressive acoustic and visual dimension. Reduced exhaust gas pressure promotes spontaneous power delivery, while a controllable exhaust flap and the special geometry of the tailpipe help generate the highly emotional sound that is typical of John Cooper Works models. The sports exhaust system also has tapered chrome covers for the dual tailpipes. 6-speed manual transmission as standard, 8-speed Steptronic sports transmission as an optional extra. The standard 6-speed manual transmission is weight-optimised in design as well as exhibiting a high level of internal efficiency and shift comfort. A gear sensor enables active engine speed adaptation for particularly dynamic shifting. Short shifts and the model-specific gear lever knob facilitate precise gear selection. An 8-speed Steptronic sports transmission is optionally available, operated by means of a distinctively designed selector lever as well as shift paddles at the steering wheel. It offers particularly short shift times and a Launch Control function for traction-optimised sprint manoeuvres from standing. This also has a positive impact on efficiency. With the standard manual transmission, the new MINI John Cooper Works Countryman has a combined fuel consumption of 7.4 litres per 100 kilometres and a CO2 emissions level of 169 grams per kilometre. In conjunction with the 8-speed Steptronic sports transmission, these figures are reduced to 6.9 litres and 158 grams respectively (provisional EU test cycle figures). With ALL4 from the dirt road to the race track. The performance capacity of the new MINI John Cooper Works Countryman is not just very high, it is also extremely versatile in terms of the potential range of uses. This is due to the ALL4 all-wheel drive system, which not only optimises traction on unsurfaced terrain such as dirt roads but also enhances ride stability in adverse weather conditions and improves agility when taking bends dynamically on the race track. The system’s electronic control unit is linked to the DSC (Dynamic Stability Control), ensuring a consistently fast and precise response at all times in distributing the drive torque between the front and rear wheels. Thanks to its compact and weight-optimised design, the current version of the ALL4 all-wheel drive system offers a particularly efficient form of variable power distribution. It consists of a power take-off bevel gear on the front axle differential, a dual-section propeller shaft and a rear axle differential with an electrohydraulically controlled hang-on clutch. In order to reduce the torque loss that occurs when drive power is transferred to the rear axle, the new MINI John Cooper Works Countryman uses active DSC with the brand’s characteristic front-wheel drive in normal situations on the road. Only when necessary does the hang-on clutch relay drive torque to the rear wheels within a fraction of a second. Sports chassis for maximum agility when sprinting, on bends and during braking manoeuvres. The high-quality suspension technology of the new MINI John Cooper Works Countryman offers the perfect basis for maximum performance and enthralling handling properties. It is designed to harmonise with the extremely high engine output of this versatile top athlete as well as its long wheelbase, large track and low centre of gravity. A single-joint spring strut axle at the front is combined with a multilink rear axle in a model-specific version. What is more, the standard sports suspension of the new MINI John Cooper Works Clubman features a particularly tight set-up of the suspension and damping systems. The speed-related Servotronic steering support – likewise a standard feature – promotes precise handling on bends and comfortable manoeuvring at low speeds. The sports brake system was designed in collaboration with specialist manufacturer Brembo and comprises 4-piston fixed-caliper disc brakes on the front wheels, guaranteeing consistently high deceleration rates even when subjected to intense use. The brake calipers are finished in red and bear the John Cooper Works logo at the front. The Dynamic Stability Control system also ensures optimum traction on sprints, agility on bends and safe deceleration. Its functions include Dynamic Traction Control (DTC), Electronic Differential Lock Control (EDLC) – which acts as an electronic locking function for the front axle differential – and Performance Control for agile turning when taking bends at speed. The standard trim also includes 18-inch John Cooper Works light alloy wheels in Black Thrill Spoke. John Cooper Works light alloy wheels in the sizes 18 and 19 inches are optionally available. 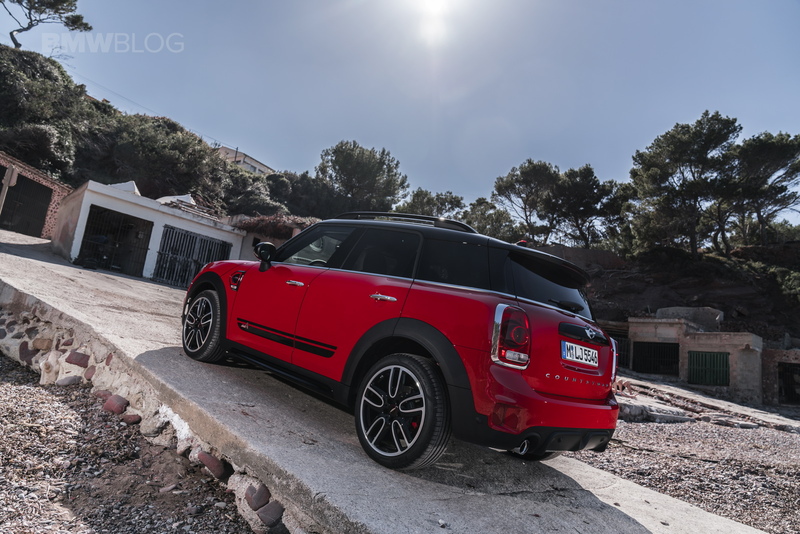 MINI Driving Modes and Dynamic Damper Control enable an individualised vehicle set-up. The standard MINI Driving Modes enable a vehicle set-up that is geared towards both the situation on the road and the driver’s individual preferences. A rotary switch at the base of the gear or selector lever is used to activate the settings SPORT, MID and GREEN. This influences the characteristic curves of the accelerator pedal and steering, the engine acoustics, the shift characteristics of the 8-speed Steptronic sports transmission, if the latter is fitted, and the Dynamic Damper Control set-up. The characteristics of the electronically controlled dampers are geared to a particularly dynamic driving style in SPORT mode and support a more comfort-oriented style in the other two modes. GREEN mode is designed for comfortable yet efficiency-optimised driving. A supporting feature here is the coasting function, which can be used in conjunction with the 8-speed Steptronic sports transmission. In GREEN mode, the drivetrain is decoupled at speeds of between 50 and 160 km/h as soon as the driver’s foot is removed from the accelerator pedal. Exterior: a clear indication of versatile athleticism. The exterior design of the new MINI John Cooper Works Countryman expresses the model’s distinctive combination of extreme athleticism and exceptional versatility. 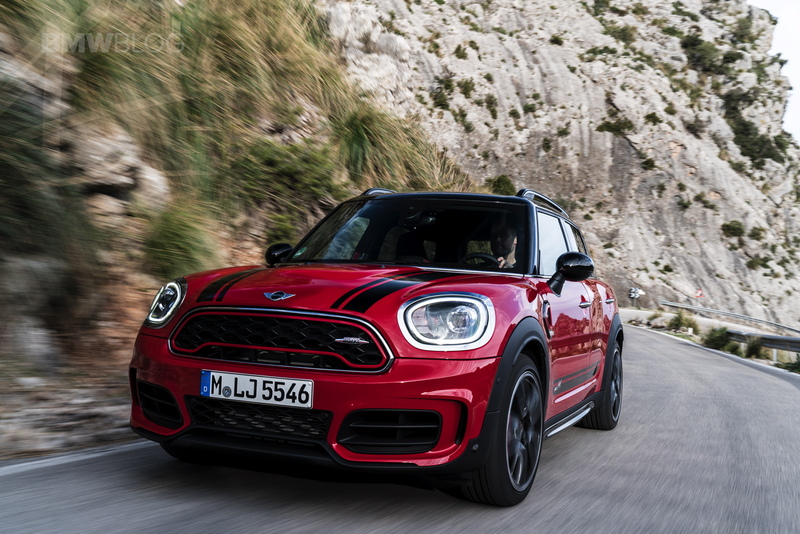 With a length of 4 299 millimetres, a width of 1 822 millimetres and a height of 1 557 millimetres, it is unmistakably the biggest top athlete in the family of John Cooper Works models. The typical proportions of a dynamic all-round sports car are further emphasised by model-specific features, in particular including the John Cooper Works Aerodynamics Kit. Key elements of the car’s powerful appearance include the large cooling inlets in the front apron, which take up the space reserved for parking lights and fog lamps in the new MINI Countryman. The standard roof rails and the model-specific roof spoiler underscore both the height of the body and the fact that its design is geared towards optimum aerodynamic balance. The side turn indicator surrounds known as side scuttles bear a red accentuation line and the John Cooper Works logo, as does the hexagon radiator grille with characteristic honeycomb pattern; the logo also appears on the tailgate. There are four non-metallic and six metallic variants to choose from for the body finish of the new MINI John Cooper Works Countryman. Here, Rebel Green is an option reserved exclusively for John Cooper Works models as is the contrasting paint finish for the roof and exterior mirror caps in Chili Red. Interior: more space for racing passion. Inside the new MINI John Cooper Works Countryman, the versatile performance qualities can be experienced on five fully fledged seats and in a characteristic sports car atmosphere. In addition to John Cooper Works sports seats with integrated headrests, features such as the John Cooper Works sports steering wheel with multifunction buttons, the John Cooper Works gear or selector lever and the roof liner in anthracite all contribute to the car’s intense feeling of racing flair. A distinctive cockpit design is combined with optimised space and a high degree of versatility. Head, shoulder and leg room are significantly more generous than in the predecessor model, both at the front and the rear. The rear seats can be shifted longitudinally by up to 13 centimetres in a 60 : 40 split, while additional versatility is provided by backrest elements that are tilt-adjustable and foldable in a 40 : 20 : 40 split. One unique option for pit stops in distinctive MINI style is the Picnic Bench, a flexible surface that folds out of the luggage compartment and provides seating for two people. Another optional fitting is an electric tailgate control that allows touchless opening and closing in conjunction with the standard Comfort Access. Exceptional athlete with exclusive fittings. 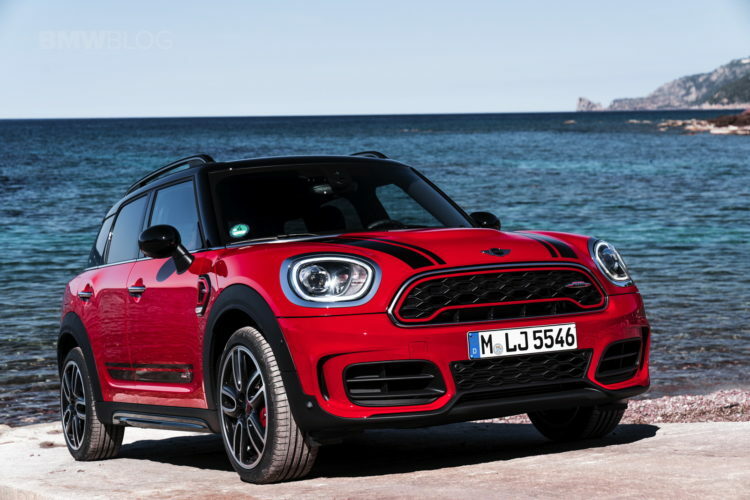 The exceptional standing of the new MINI John Cooper Works Countryman both in the premium compact segment and the brand’s model program is underscored by its exclusive equipment items. The standard LED headlamps optimise visibility when driving in the dark as well as giving the appearance of the car’s front section a striking contour. The daytime driving light is generated by a band of light running entirely around each headlamp, likewise using LED technology. Standard features also include cruise control with brake function and the Radio MINI Visual Boost including USB socket and operation via MINI Controller on the centre console, and there is a 6.5-inch screen in the central instrument that displays a start motif specific to John Cooper Works when the driver gets in the car. Modern driver assistance systems, high-quality options for comfort and individual style. The driver assistance systems developed for the current model generation enhance comfort and safety in the new MINI John Cooper Works Countryman, too. The standard collision warning with city braking function can be extended to include the Driving Assistant system with camera-based active cruise control, pedestrian warning with initial brake function, high beam assistant and road sign detection. Other features to choose from include Park Distance Control with sensors at the front, rear view camera and Parking Assistant. In addition to information on road speed, speed limits and overtaking bans detected, current navigation directions and Check Control messages, feedback from the driver assistance systems and lists of telephone contacts and entertainment programs, it is also possible to display the currently selected gear and a multi-coloured engine speed scale on the special John Cooper Works Head-Up Display. 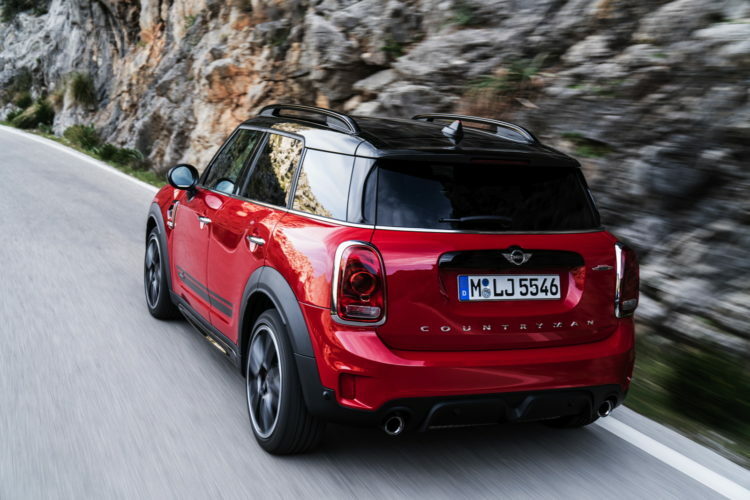 The program of optional equipment items for the new MINI Countryman is also available for the extremely sporty model version. These include a panorama glass roof, 2-zone automatic air conditioning, seat heating for driver and front passenger, windscreen heating, electrically heatable and folding exterior mirrors and an alarm system with a red LED status indicator in the fin antenna. Central instrument with touchscreen, MINI Find Mate and MINI County Timer. Other options include the Harman Kardon hi-fi system, the MINI navigation system and the MINI navigation system Professional. The features of the Wired package including MINI navigation system Professional comprise the Touch Controller on the centre console and an 8.8-inch colour screen in the central instrument; the latter is a touchscreen, allowing functions to be selected and adjusted at the tip of the finger. Also included in the Wired package is MINI Find Mate, one of the latest digital services to be added to MINI Connected. MINI Find Mate consists of so-called tags with a wireless tracking function that can be attached to commonly used objects and travel items, enabling them to be conveniently located via MINI Connected. If the tag is located outside the wireless range, the most recently registered position is displayed on the on-board computer and on the driver’s smartphone. As soon as the smartphone or vehicle moves back into the tag’s wireless range, the tag can be activated and acoustically located. In conjunction with the Wired package it is also possible to use the MINI Country Timer, which registers all travel over sloping, uneven, unsurfaced or snow-covered roads and tracks. The duration and intensity of driving on demanding terrain is displayed in typical MINI style on the central instrument screen. MINI Connected, the digital personal mobility assistant. The new MINI John Cooper Works Countryman also demonstrates fascinating performance and great versatility in the area of connectivity. Going beyond the familiar functions of an in-car infotainment program, MINI Connected acts as a personal mobility assistant in the top athlete of the model range, too Based on a flexible platform, the Open Mobility Cloud, MINI Connected integrates the vehicle seamlessly into the MINI driver’s digital life via touchpoints such as the Apple iPhone and Apple Watch. Thanks to the integral concept of MINI Connected, mobility doesn’t start in the vehicle. MINI Connected informs the driver of the optimum departure time based on calendar entries and current traffic data. Address data and appointments saved by the driver previously on a smartphone via MINI Connected are automatically transferred to the car and do not have to be entered in the navigation system again. MINI Connected can also save regularly visited places as favourite destinations, and it detects frequently covered routes such as the daily run between home and work so as to be able to inform the driver in the event of unexpected traffic delays.